Sally Shalaby was born in Zagazig, Egypt in 1974. She received the M.Sc. and Ph.D degrees in medical biochemistry and molecular biology from Faculty of Medicine, Zagazig University, Zagazig, Egypt, in 2003 and 2007, respectively. 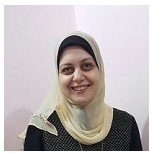 Her Current positionis assistant professor of Medical Biochemistry, Faculty of Medicine, Zagazig University. Her main areas of research interest are genetics, immunology and recently stem cell therapy. Dr. Sally is a member of the Egyptian Society of Biochemistry & Molecular Biology, the Egyptian Society of Tumor Markers Oncology, and the Arab society of Stem Cells & Molecular Biology. She was the principle investigator of the projectfunded by Zagazig University Projects, Zagazig University Post Graduate and Research Affairs titled"Gene polymorphisms of IL-4, IL-10 and IL-13 and their receptors as immunobiochemical markers in atopic and non-atopic children" 2008-2009. She was a partner in the team work of other projectsfunded by Zagazig University.